I love to travel the world but I also cherish the beautiful land I call home: Sicily. I’m always up to enjoy delicious food, discover beautiful beaches, festivals and events, explore archaeological and historical sites all over. Last week I decided to visit Noto (SR) with a few friends. 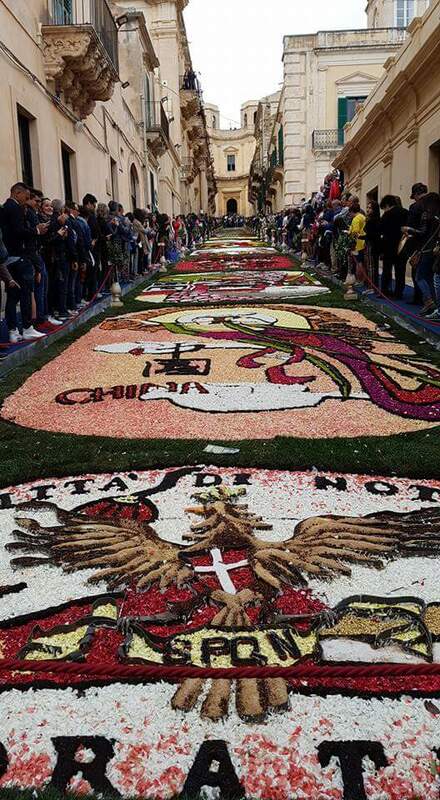 It was our first time experiencing this beautiful baroccan city and the flower festival called “Infiorata” held every year the third Sunday in May. We were immediately fascinated and we ended up staying the whole day! Starting from the “Arco di Trionfo” we walked on corso Vittorio Emanuele that brought us to the heart of Noto, Piazza Duomo, also known as Piazza Ducezio where we visited the Cathedral and Palazzo Ducezio (situated opposite one another). Noto and its cathedral, were included in the UNESCO World Heritage Sites in 2002. Noto, first known as Neas, was founded by the Sican population at the time of the fall of Troy! In 1693 a powerful earthquake struck the whole of south-western Sicily and Noto was completely destroyed. Architects were hired to relocate and rebuild the city and today we can appreciate a spectacular urban settlement planned on a grid system with the main roads all oriented from the east to the west and therefore always illuminated by the sun. The characteristic golden yellow limestone used to build the churches and palaces gifts visitors with a warm, romantic and compelling atmosphere, especially at sunset. The clergy’s road was corso Vittorio Emanuele hence…all the churches built along the way. Despite a bit of rain throughout the morning, people kept coming to see the “Baroque Flower Festival” and there was a cool crowd all day especially around the “floral carpet” in via Nicolaci and the Church of Montevergine at the end of the street. Millions of flower petals form 16 different “mosaics” that cover an area of 700 square meters. There’s a different theme every year, this year it was “Homage to China – Silk Roads”. Local and foreign artists work on the carpet on Friday and the complete design can be appreciated on Saturday and Sunday. It takes up to 15 hours to complete all the designs! After the festival, on Monday morning, it’s tradition for local children to run riot on the flower displays because it symbolizes the cycle of “destruction and renewal” that’s part of everyone’s life and Noto’s own history. Other attractions and sideshows where all over Corso Vittorio Emanuele and I truly enjoyed the festival atmosphere all around. While exploring in the afternoon I found something completely unexpected… A Waffle Shop! I tasted my first official waffle stick in Copenhagen last year and I fell in love. Unfortunately we don’t have it where I live and imagine my surprise when I found this place! There’s no comparison to the one I ate in Copenhagen but it tasted great anyway! I was so happy about my little discovery!! The flower festival was concluded with a beautiful show outside Palazzo Ducezio.